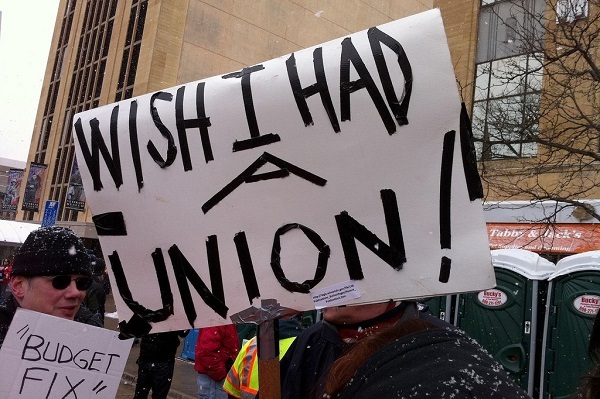 What do unions do for non-union workers? In the labor movement’s heyday during the 1950s, about one-third of American workers in the private sector belonged to a union. By the late 1970s, that fraction had fallen to roughly 1 in 5. Today, about 1 in 20 private sector workers belong to a union. This level of unionization places the U.S. near the bottom among advanced democracies. In France, Sweden, and Denmark, over 80 percent of the total workforce is covered by union-negotiated agreements. Over half of the German workforce is covered, and Canada’s coverage rate is roughly double that of the U.S.
Because unions garner generally higher wages for their members – roughly 10 to 25 percent higher than for non-union members – their erosion has meant that workers who may have once belonged to one miss out on this premium. Strong unions boost the wages of workers who don’t belong to one, too.